If you frequently lug a laptop around, you know how horrible it is when your cables tangle into a homogenous mess. Aviiq's Ready Clips USB cables solve the problem with a nice bit of style. Portable, stylish USB cables with micro-USB, mini-USB, and Apple 30-pin connectors. The gadget fiend on the go. Sharp angles, a stiff charcoal-colored body, bright accent colors and pocket clips. Not your average cable. 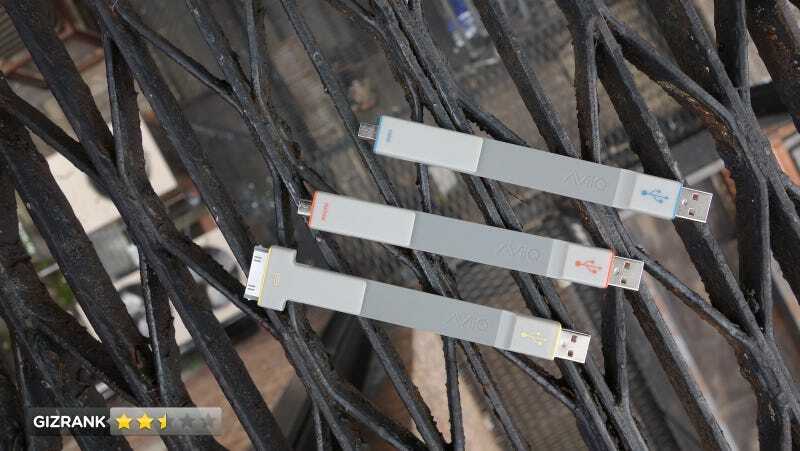 Slip them in a bag or pocket, and use them like any other USB cable. They're too rigid. The same thing that makes these cables so great and non-tangly makes them maddening to use. The MicroUSB cable wouldn't fit the connector on the Sony RX100. The cable works with other devices, and the RX100 works with other MicroUSB cables. Bizarre. Used in various configurations with a MacBook Pro, iPhone, Mophie, mini Belkin power strip, and a Sony RX100 camera. These cables actually got a compliment. That's a first. Ultimately, no. These cables aren't horrible. They actually have some nice qualities to them. But the inflexible shape really limits how you can position your devices when connected. Instead, just go for a super short cable that's more bendy. Certainly not as flashy, but ultimately much more versatile. • Dimensions: 4.7" x 0.6" x 0.3"